Combine the flour, corn starch, salt, and xanthan gum in a large mixing bowl. Knead in the egg and butter, little by little until combined and a dough forms. Form into a ball, cover with plastic wrap, and transfer to the fridge to rest for approx. 30 min. Preheat the oven to 180°C/350°F. 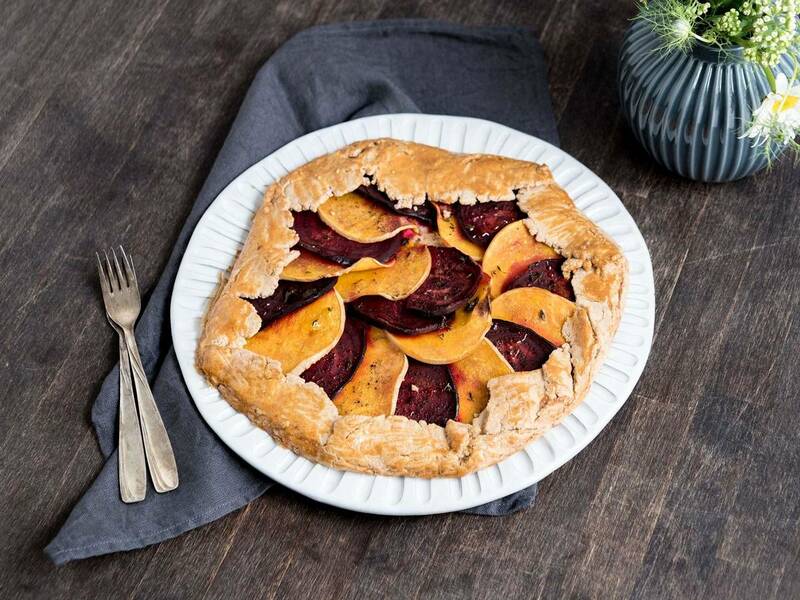 Slice the squash and beetroot finely with a mandolin, then lay the slices out on a baking sheet. Roughly chop walnuts. Remove dough from the fridge and set over a sheet of parchment paper. Roll out into a circle approx. 34 cm/13 in. in diameter. Spread the goat cheese over the dough, leaving approx. 4 cm/1.5 in. around the perimeter, then sprinkle with chopped walnuts. Pluck thyme leaves from stems and sprinkle half over the dough. Assemble the squash and beetroot slices over the goat cheese and sprinkle remaining thyme and salt and pepper over everything. Carefully fold over edges of dough. Brush dough with milk. Transfer galette to oven at 180°C/350°F for approx. 40 min., or until the dough is golden brown and the vegetables are cooked through. Remove from oven, let cool slightly, then serve warm. Enjoy!